A set of 4 large finials with different seasons elements on each one for garden decoration. The large hand carved drapes all around have the seasons motif with grapes, leaves,flowers, fruits decoration. The seasons are carved also on the big crest (in total two crest for each Finial). A top cover with round finial carved with drapes and fruits, leaves decor with a fruit basket as finial top. A large leaves are carved at the base on the bugne details. Rings all around where starting the drapes decorations.A pair of monumental Finials hand carved in natural stone by our sculptors. The original design was made several years ago, all the carving details are hand made by expert Italian sculptors that working as antique technique. A pair of master pieces that will have nice on your gardens or entry gate. 18th Century inspired design. 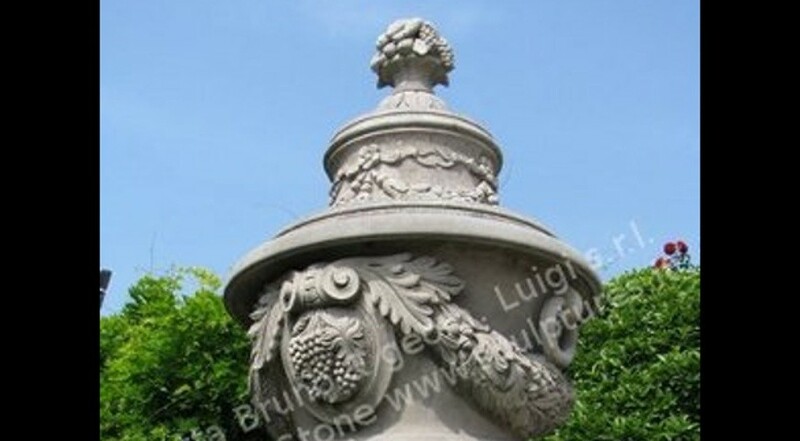 Finial is the perfect garden ornament for a formal garden gateway, perhaps to a walled garden. Dimensions: Finial Height 8' 3" x Diameter 49"; Base Height 59"